Introduction: Irritable bowel syndrome (IBS) is a common functional gastrointestinal disorder. Treatment can improve symptoms and social functioning in the patients. This study was designed to assess the effect of adding Luvos supplementation to mebeverine on improving symptoms and quality of life (QOL) in patients with diarrhea-predominant irritable bowel syndrome. Methods: Eighty patients with diarrhea-predominant IB, ages 18-65, were diagnosed by the Rome IV criteria and randomly assigned to the study. Forty patients (group A) received mebeverine (135 mg) twice a day (bid) plus Luvos®Healing Earth (1 sachet, bid). The other 41 patients (group B) received mebeverine (135 mg) bid for 4 weeks. Basic demographic data, Bristol score, symptom severity score, and QOL questionnaire were recorded at the start and completion of treatment. The data were analyzed by SPSS version 22. Results: Seventy one of the patients (35 and 36 patients in groups A and B, respectively) completed the study. The majority of the patients were young males, unmarried and highly educated. Diarrhea and QOL were both significantly improved in group A when compared to group B (P=0.036 and P=0.028, respectively). We did not find a significant difference (improvement) in abdominal pain or overall symptom score between group A (mebeverine + Luvos) compared to group B (mebeverine alone) (P=0.096 and P=0.071, respectively). Mild and tolerable adverse effects were observed in 2.8% (2/71) of the patients. Conclusion: According to our results, Luvos supplementation is safe, effective and well-tolerated in diarrhea-predominant irritable bowel syndrome patients. Further study with a larger sample size is recommended to evaluate the efficacy of this natural clay-like medicine. Irritable bowel syndrome (IBS) is a chronic, relapsing disorder that is defined by a combination of frequent abdominal pain related to change in bowel habits 1. IBS can be classified into four subgroups based on the predominance of bowel habits: diarrhea, constipation, mixed, and unspecified 2. Identifying the relevant IBS subgroup is important for selecting appropriate diagnostic tests and treatment strategies for each patient 234. The worldwide prevalence of IBS is estimated as 16-26%. IBS is more prevalent in women than men (ratio approximately 2:1) 2. The incidence of diarrhea-predominant irritable bowel syndrome (IBS-D) is now growing, which can cause a high economic burden on patients and health care systems worldwide 256. The pathogenesis of IBS is multifactorial and consists of genetics, early-life factors, altered gut flora, immune activation, altered intestinal permeability, brain-gut interactions, visceral sensorimotor dysfunction, autonomic dysfunction, and psychosocial stress with cognitive factors 13. Physicians should consider the pathogenesis of IBS to manage their patients appropriately 78. Regarding diagnosis, according to the Rome IV criteria, IBS is diagnosed by weekly (or more frequent) abdominal pain, which is associated with change in bowel habit and which lasts for more than 3 months 3. IBS-D is mainly diagnosed by symptoms; no definite laboratory or imaging test can be performed to confirm diagnosis. IBS-D diagnosis is confirmed after excluding other disorders 5. Therapeutic options have focused on alleviating symptoms of IBS-D patients. Treatment starts with modification of diet and lifestyle. Organic food medicine may be advised at first. Lifestyle modifications consist of exercising, sleeping appropriately, dieting, and decreasing stress 2. A gluten-free diet low in fermentable oligosaccharides, disaccharides, monosaccharides, and polyols (FODMAPs) is advised to the patients. As the next steps, adjunctive treatment, over the counter and/or prescribed medications, and psychological therapies are also recommended to the patients 26. IBS may co-exist with other bio-psychosocial disorders and have a negative impact on QOL 6; hence, many conventional treatments for IBS target these disorders 39. Treatments can be also be pharmacologic or non-pharmacologic. Pharmacologic approaches consist of the following: synthetic peripheral μ-opioid receptor agonists, antidiarrheal agents, antispasmodic agents, antidepressants, serotonin 5-HT3 antagonists, the non-absorbable antibiotic rifaximin, probiotics, bile acid sequestrated medicine, and/or supplementary medicines 6. Indeed, antispasmodic agents have been commonly used worldwide for IBS-D treatment. Antidepressant agents, however, are more commonly used in the United States 6. Non-pharmacologic therapies consist of cognitive behavioral therapy, hypnotherapy, multi-component psychological therapy, and/or dynamic psychotherapy 1011. Some pharmacologic agents, namely antispasmodic therapy, can reduce pain associated with IBS through the inhibition of contractile pathways in the gut and can increase colon transit time, thereby reducing diarrhea. Previous studies have shown that these medications are effective in the treatment of IBS-D, even when prescribed as a single medication 12. However, pharmacological agents cannot completely eliminate IBS symptoms and, thus, some IBS patients may need up to four medications concomitantly. Moreover, previous studies have shown up to a 70% placebo effect in treatment of IBS patients 3. About 15–50% of IBS patients typically look for complementary and alternative medicine (CAM) to relieve their annoying symptoms. The main reasons are inadequate response to conventional medications, recurrent symptoms, psychological disorders, a need for a natural management approach, and doubt about the safety of newly prescribed medications 1314. The latter includes peppermint oil, melatonin and clay-like materials, which have been shown to be effective in treating some IBS symptoms 3. Healing earth refers to tiny rock particles which originated from the ice age and prepared from pure loess. The earth has a unique natural combination of minerals and trace elements. It can bind to gut microbiome and absorb harmful metabolic products in the gut. By this mechanism, germs and noxious substances are excreted in the feces, and the balance of the intestinal flora is recovered gradually but without any deleterious adverse effects. Frequent bothersome symptoms of IBS-D include flatulence and diarrhea, which can be improved efficiently by this clay like medicine 141516. The study herein was designed to assess the efficacy of combining Luvos®Healing Earth with mebeverine in relieving symptoms and facilitating QOL improvement in patients with IBS-D. This study was a randomized clinical trial. Eighty two patients, of ages 18-65 years, with IBS-D (based on Rome IV criteria) were enrolled in the study. Rome IV criteria for defining IBS-D included: abdominal pain (at least once per week) and relation to 2 or more of these other criteria (stool frequency >3/day, loose stool texture, urge in defecation, and mucus passage) in at least 25% of the defecations. Figure 1 . Flow chart of the method of follow-up and treatment efficacy. The exclusion criteria consisted of: history of lactase deficiency, celiac disease, inflammatory bowel disease, food allergy, pregnancy, systemic diseases (e.g. diabetes mellitus, hypertension, cardiac disease, pulmonary, renal, liver or thyroid diseases, cancer, myopathy, neuropathy, scleroderma, etc. ), abdominal surgery, allergy to prescribed medications, and lack of cooperation. 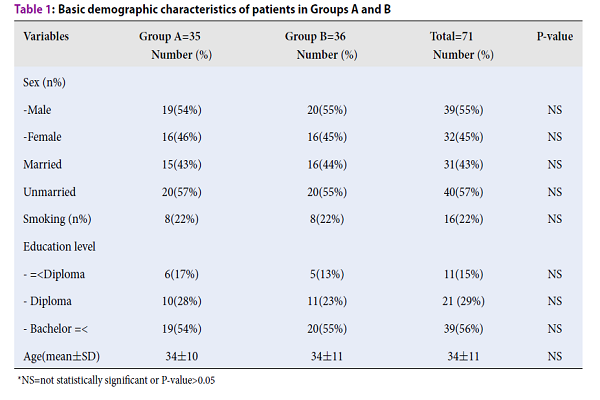 Patients were assigned to the treatment groups (n=41 patients per group) according to the computerized generated random table. For treatment, Group A received mebeverine (135 mg bid) and Luvos®Healing Earth (Heilerde-Gesells Chaft Company, Germany; 1 sachet bid). Group B received only mebeverine (135 mg bid). The duration of treatment was 4 weeks for both groups. All the researchers of this study were believed in Helsinki –Ethical principles. All patients entered the study after receiving complete explanation about the study and providing written consent. Our study was approved by the Ethics Committee of Iran University of Medical Sciences (IR.IUMS.REC 1395.9311160002); the study protocol was registered in the Iranian Registry of Clinical Trials (IRCT20141201020178N7). Basic demographic data were recorded at the beginning of treatment. Daily symptom severity scores, for abdominal pain, urge, bloating, abdominal cramp and epigastria pain, were recorded at the first visit (before start of treatment), second visit (2 weeks after start of treatment), third visit (4 weeks after start of treatment), and fourth visit (2 weeks after completing treatment) 317. The daily symptom severity score ranged from zero (no symptoms) to 10 (most severe symptoms). This was the qualitative tool used to clinically assess the relevance and efficacy of the treatment 3. All patients were asked to fill a self-reported validated Persian version of IBS-D quality of life questionnaire (QOL), and Bristol score at the beginning and end of treatment. The IBS-QOL questionnaire comprises of 34 items with 5-point response scales (0 to 4) that covers eight dimensions of health-related quality of life (HRQL). These 8 parameters include: dysphoria (8 items), interference with activity (7 items), body image (4 items), health worries (3 items), food avoidance (3 items), social reactions (4 items), sexual concerns (2 items), and relationships (3 items). With respect to the raw scores from the QOL questionnaire, the higher scores represented lower QOL 18. Improvement of symptoms was shown by a decrease in 2 or more scores based on the symptom severity scoring. We analyzed the per-protocol improvement rate (i.e. all patients who improved symptoms after completing the study, out of all patients who completed the study). The patients who consumed at least 80% of prescribed medications in 80% of the treatment duration time were considered to have completed treatment. Drug adverse effects were recorded at the middle (week 2) and end (week 4) of treatment. The improvement in diarrhea rate in the only single arm (before and after treatment) study was 43%. We considered A= 0.05 (z=95%) and B = 0.80. The final estimated number patients in each group was 41 15. Data were analyzed using SPSS software for Windows (version 22; SPSS Inc., Chicago, IL, USA). The quantitative variables was expressed as mean ± standard deviation (SD); qualitative variables were expressed as percentage. The quantitative and qualitative variables were analyzed by t-test and Pearson chi-square test, respectively. P-value < 0.05 was considered statistically significant. Eighty patients with IBS-D were enrolled. A total of 9 patients were excluded from the study: 3 did not have follow-up, 5 did not complete the questionnaire, and 1 was discontinued off medication due to poor adherence (Figure 1). Thus, 71 patients completed the study (group A: n=35, group B: n=36). The mean age was 34±11 years. The majority of patients were male 39/71 (55%), unmarried, and highly educated. The demographic characteristics were not significantly different between the two groups (Table 1). Total and sub-scale raw scores of IBS-D QOL questionnaire were compared at the start and end of treatment. No significant differences were observed between the two treatment groups at the beginning of the study. After treatment, the total raw score of QOL was significantly improved in group A compared to group B (P=0.036). All sub-scales of QOL scoring, except for body image, were significantly improved in group A compared to group B (Table 2). The symptom severity scores, including for stool frequency, abdominal pain and cramp, epigastric pain, urge and bloating, were compared at the start and end of treatment. No significant differences were seen between the two treatment groups at the beginning of the study. The symptom severity score for all items in group A was significantly improved after treatment. Symptoms were significant improved in group A at 2 weeks after treatment completion (Table 3). The symptom severity score for abdominal pain and cramp, urge and bloating, in group B, was also significantly improved after treatment. Indeed, except for urge and epigastric pain, all other symptoms were significantly improved in group B at 2 weeks after treatment completion (Table 4). Regarding improvement rate, only diarrhea (a main symptom in IBS-D) was significantly improved in the two treatment groups. Although abdominal pain and overall IBS-D symptoms were improved, they were not statistically significant (Table 5). We found near to 100% compliance rate in this study. The adverse effect rate was 2.8% (dyspepsia and constipation). Adverse effects were mild, tolerable and transient. The goal of IBS treatment is to improve symptoms and QOL in IBS patients 9. Previous studies have found that antispasmodic agents can significantly improve overall symptoms of IBS and associated abdominal pain without any serious adverse events 19. Antispasmodic agents are superior to placebo in spite of a high placebo effect (38% overall improvement) in treated IBS patients. These agents can regulate GI motility function, change bowel habit and relieve abdominal pain 91220212223242526. A meta-analysis showed that 200 mg of mebeverine had the same effect as 135 mg in clinical assessments of symptom improvement in IBS patients 20. The incidence rate of adverse effects of mebeverine is equal to 0.1-0.6 events per patient-year of exposure; it has a favorable tolerance even in dosage of 600 mg per day 20. Studies have also found that all dosages of mebeverine might be effective in more than 80% of IBS patients. The tolerability of mebeverine has also been excellent, and compliance rate was about 100% for most of the patients 24. Many herbal medicine and natural products have been used to treat IBS alone or in combination with other medications. However, their therapeutic effectiveness is often inconclusive because of small sample sizes, inadequate data analyses, and lack of standardized preparations in previous studies. Physicians have considered an “enhanced placebo effect” for these agents. Past studies showed that diarrhea and flatulence might be treated naturally for a long time, thereby, creating a positive effect on QOL 15. We also found a similar effect during the 2-week follow up in our study. Clay-like materials are effective in treating some IBS symptoms, while their true pharmacology remains obscure. Clay-like materials (at least equivalent to placebo effect) may be considered as a supplement or alternative to treat IBS-D patients 3. A single arm study was done on 64 IBS patients by Charité et al. The patients had received only Luvos-Healing Earth for six weeks. Of note, the complaints and QOL markedly improved, even after 3 weeks of treatment. However, Luvos should be used at least 3-6 weeks in duration in order to achieve a long-term effect 15. Patient compliance was recorded, as were mild constipation, other gastrointestinal symptoms, and other adverse effects. The results of our study were similar to this study since we found 2.8% of adverse effects in group A; the adverse effects were also mild, tolerable and transient. Moreover, they found that the symptoms of IBS improved in 50% of patients after a 6-week treatment with Luvos. Also, the efficacy was not reduced by longer use of Luvos, and Luvos was safe in IBS-D patients 15. The adherence rate to treatment was near 100% in our study. Diarrhea was improved in 87% and 56% of patients in group A and B, respectively. Abdominal pain was improved in 70% and 62% of patients in group A and B, respectively. Overall symptoms of IBS-D were improved in 26% and 20% of patients in group A and B, respectively. Thus, our study results are similar to results of previous studies. Notably, in our study, diarrhea and QOL were improved significantly in group A compared to group B. It seems that improvement of symptoms in group A persisted for at least 2 weeks after treatment discontinuation. As we demonstrated in our study, the combination of mebeverine and Luvos® Healing Earth supplementation had a significant improvement in symptoms, such as abdominal pain and cramp, urge sensation, bloating and diarrhea. By per protocol analysis, diarrhea was improved significantly in group A. The improvement after discontinuation of treatment was more persistent in group A. Finally, QOL, as a main goal of IBS patient management, was significantly improved in this group. Nowadays, CAM has progressed in the market, even in Western society such that the tendency of physicians to accept CAM is rising 722. CAM has demonstrated to be more cost-effective than conventional medications. Also, patients may rely on CAM more than synthetic medications 23. It seems that physicians should be at ease with CAM, at least in IBS patients. However, CAM is not without side effects; thus, safety and effectiveness should be evaluated before recommendation 21242526. This study has some limitations. The sample size is small and the majority of findings were qualitative (which depend on how the patients remembered them). A further study with large sample size should be designed to generalize the results. In brief, this study showed that Luvos supplementation is safe, effective, durable and well-tolerated in IBS-D patients. We recommend this natural supplement to treat symptoms of IBS-D patients. It can improve the QOL and social functioning in IBS-D patients. Further, studies with large sample sizes are recommended to evaluate the efficacy of this natural clay-like medicine. Annaházi A., Róka R., Rosztóczy A., Wittmann T.. Role of antispasmodics in the treatment of irritable bowel syndrome. World Journal of Gastroenterology. 2014; 20 : 6031-43 . Foxx-Orenstein A. E.. New and emerging therapies for the treatment of irritable bowel syndrome: an update for gastroenterologists. Therapeutic Advances in Gastroenterology. 2016; 9 : 354-75 . Marquis P., Lasch K. E., Delgado-Herrera L., Kothari S., Lembo A., Lademacher C.. Qualitative development of a patient-reported outcome symptom measure in diarrhea-predominant irritable bowel syndrome. Clinical and Translational Gastroenterology. 2014; 5 : e59 . Quigley E. M., Khan A. G.. Irritable bowel syndrome: recent progress in pathophysiology, diagnosis and management?. Journal of Ayub Medical College, Abbottabad. 2009; 21 : 1-2 . Sobolewska-Włodarczyk A., Włodarczyk M., Storr M., Fichna J.. Clinical potential of eluxadoline in the treatment of diarrhea-predominant irritable bowel syndrome. Therapeutics and Clinical Risk Management. 2016; 12 : 771-5 . Lucak S., Chang L., Halpert A., Harris L. A.. Current and emergent pharmacologic treatments for irritable bowel syndrome with diarrhea: evidence-based treatment in practice. Therapeutic Advances in Gastroenterology. 2017; 10 : 253-75 . Quigley E. M., Lembo A. J.. Irritable Bowel Syndrome: An Infectious Disease?. Gastroenterology. 2017; 152 : 936-8 . Klem Fabiane, Wadhwa Akhilesh, Prokop Larry J, Sundt Wendy J, Farrugia Gianrico, Camilleri Michael, Singh Siddharth, Grover Madhusudan. Prevalence, risk factors, and outcomes of irritable bowel syndrome after infectious enteritis: a systematic review and meta-analysis. Gastroenterology. 2017; 152 : 1042-1054. e1 . Chang F. Y., Lu C. L.. Treatment of irritable bowel syndrome using complementary and alternative medicine. Journal of the Chinese Medical Association. 2009; 72 : 294-300 . Chen C., Tao C., Liu Z., Lu M., Pan Q., Zheng L.. A randomized clinical trial of berberine hydrochloride in patients with diarrhea‐predominant irritable bowel syndrome. Phytotherapy Research. 2015; 29 : 1822-7 . Laird K. T., Tanner-Smith E. E., Russell A. C., Hollon S. D., Walker L. S.. Comparative efficacy of psychological therapies for improving mental health and daily functioning in irritable bowel syndrome: A systematic review and meta-analysis. Clinical Psychology Review. 2017; 51 : 142-52 . Martínez-Vázquez M. A., Vázquez-Elizondo G., González-González J. A., Gutiérrez-Udave R., Maldonado-Garza H. J., Bosques-Padilla F. J.. Effect of antispasmodic agents, alone or in combination, in the treatment of Irritable Bowel Syndrome: systematic review and meta-analysis. Revista de Gastroenterologia de Mexico. 2012; 77 : 82-90 . Tilburg M. A. van, Palsson O. S., Levy R. L., Feld A. D., Turner M. J., Drossman D. A.. Complementary and alternative medicine use and cost in functional bowel disorders: a six month prospective study in a large HMO. BMC Complementary and Alternative Medicine. 2008; 8 : 46 . Koloski N. A., Talley N. J., Huskic S. S., Boyce P. M.. Predictors of conventional and alternative health care seeking for irritable bowel syndrome and functional dyspepsia. Alimentary Pharmacology & Therapeutics. 2003; 17 : 841-51 . Höllriegl V., Li W. B., Leopold K., Gerstmann U., Oeh U.. Solubility of uranium and thorium from a healing earth in synthetic gut fluids: a case study for use in dose assessments. The Science of the Total Environment. 2010; 408 : 5794-800 . Ford A. C., Quigley E. M., Lacy B. E., Lembo A. J., Saito Y. A., Schiller L. R.. Efficacy of prebiotics, probiotics, and synbiotics in irritable bowel syndrome and chronic idiopathic constipation: systematic review and meta-analysis. The American Journal of Gastroenterology. 2014; 109 : 1547-61 . Rosa K., Delgado-Herrera L., Zeiher B., Banderas B., Arbuckle R., Spears G.. Psychometric assessment of the IBS-D daily symptom diary and symptom event log. Quality of Life Research: An International Journal of Quality of Life Aspects of Treatment, Care and Rehabilitation. 2016; 25 : 3197-208 . Gholamrezaei A., Zolfaghari B., Farajzadegan Z., Nemati K., Daghaghzadeh H., Tavakkoli H.. Linguistic validation of the irritable bowel syndrome-quality of life questionnaire for Iranian patients. Acta Medica Iranica. 2011; 49 : 390-5 . Weinberg D. S., Smalley W., Heidelbaugh J. J., Sultan S., Amercian Gastroenterological Association. American Gastroenterological Association Institute Guideline on the pharmacological management of irritable bowel syndrome. Gastroenterology. 2014; 147 : 1146-8 . Darvish-Damavandi M., Nikfar S., Abdollahi M.. A systematic review of efficacy and tolerability of mebeverine in irritable bowel syndrome. World Journal of Gastroenterology. 2010; 16 : 547-53 . Lee K. J., Kim N. Y., Kwon J. K., Huh K. C., Lee O. Y., Lee J. S.. Efficacy of ramosetron in the treatment of male patients with irritable bowel syndrome with diarrhea: a multicenter, randomized clinical trial, compared with mebeverine. Neurogastroenterology and Motility. 2011; 23 : 1098-104 . Joos S., Rosemann T., Szecsenyi J., Hahn E. G., Willich S. N., Brinkhaus B.. Use of complementary and alternative medicine in Germany - a survey of patients with inflammatory bowel disease. BMC Complementary and Alternative Medicine. 2006; 6 : 19 . IsHak W. W., Greenberg J. M., Balayan K., Kapitanski N., Jeffrey J., Fathy H.. Quality of life: the ultimate outcome measure of interventions in major depressive disorder. Harvard Review of Psychiatry. 2011; 19 : 229-39 . Negaresh M., Alinejad Khorram M.. Efficacy of Iranian and foreign mebeverine on IBS patients with diarrhea attending to gastroenterology clinic of Amir-Al-Momenin between 2009 and 2013. Medical Science Journal of Islamic Azad Univesity-Tehran Medical Branch. 2016; 26 : 52-5 . Bian Z., Wu T., Liu L., Miao J., Wong H., Song L.. Effectiveness of the Chinese herbal formula TongXieYaoFang for irritable bowel syndrome: a systematic review. Journal of Alternative and Complementary Medicine (New York, N.Y.). 2006; 12 : 401-7 . Hussain Z., Quigley E. M.. Systematic review: complementary and alternative medicine in the irritable bowel syndrome. Alimentary Pharmacology & Therapeutics. 2006; 23 : 465-71 . Marjan Mokhtare, Mohammadreza Asadipanah, Mansour Bahardoust, Arezoo Chaharmahali, Arezoo Chaharmahali, Masoomeh Khalighi Sikaroudi, Mohammad Khoshdelnezamiha, Farbod Abbaskhani Davanloo, Mohsen Masoodi, Leyla Bahadorizadeh, 2018.